Code-11 is a barcode symbology developed by Intermec in 1977 and used mainly in telecommunications. The symbol can encode a string of any length (though Labeljoy limits it to 255 characters), consisting of the digits 0-9 and the dash sign (-). One or two check digit(s) can be included. Labeljoy requires you to enter a text in the text box of up to 255 characters. Code-11 requires 1 or 2 check digits. The Checksum combo box allows you to define the number of check digits to append at the end. The (automatic) selection adds a check digit to texts with a length of up to 10 digits, and two for longer texts, while selections 1 and 2 determine 1 or 2 check digits independently of the text length. 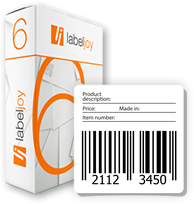 With Labeljoy is it easy to create and print Code 11 barcode labels. Note: Check digits are only appended to the barcode symbol. They are not appended to the visually readable text. The text can contain digits and dash (-) signs only. Code length must not exceed 255 digits, including dash signs. If a value is found that does not comply with the above rules, the barcode will not be displayed. The visually readable text can also be displayed above the symbol or hidden, according to the setting specified in the Text combo box.